Sign up now for the Walker newsletter and get the latest on great deals! A wide selection of AIRSEP® kits specially configured for almost every diesel engine made, regardless of age or horsepower rating, including naturally aspirated engines. Designed for reliability and high performance, these AIRSEP® kits will help keep your boat free of oil mist and Noxious fumes, and look great at the same time. Today�s heavy duty marine applications require systems that can deliver performance, reliability and long life. Ideal for Fishing, Ferry, Offshore oil rig service, or any other high hour marine application, such as main propulsion, bow thruster, genset, or auxiliary duty diesel engines. Our new CCE AIRSEP® product line will get the job done using an exclusive two stage internal filter set. 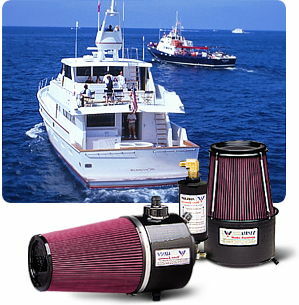 No more oil in the bilge or Noxious fumes. Saves oil and fuel consumption. No need to purchase costly filter elements each year. Helps reduce or eliminate seal leaks on older engines. Extends time between engine overhauls. Helps avoid costly Coast Guard bilge fines.